Nuremberg - The Bundesliga is gearing up for the next twist in what is becoming an increasingly enthralling tale in the relegation battle, with second-bottom 1. 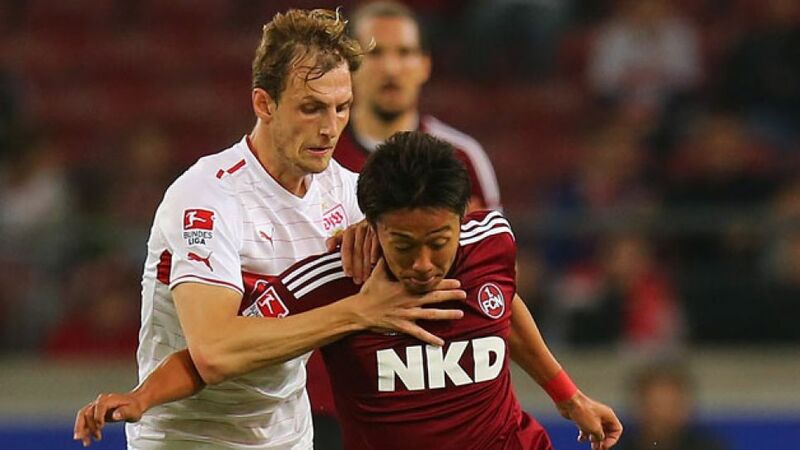 FC Nürnberg hosting 15th-placed strugglers VfB Stuttgart on Wednesday (kick-off 19:00 GMT/20:00 CET). The two basement bedfellows come into the tie with differing mindsets on the back of their Matchday 26 results. Nürnberg succumbed to a fourth consecutive loss in their 5-2 reverse at home to Frankfurt on Sunday, while the Huub Stevens era finally got up and running at Stuttgart with a 1-0 victory over Hamburger SV. Two players who won’t be taking to the field for the hosts are , who is suspended, and broken-nose victim Ondrej Petrak, forcing Verbeek into a defensive reshuffle. Nevertheless, it is not all doom and gloom in northern Bavaria, with Nürnberg taking heart from the way they fought back from 3-0 down against Frankfurt to make it 3-2, before eventually capitulating again. Key to unlocking the visiting defence will be 13-goal Drmic, whose combination play with and in that 15-minute spell in the second half had Frankfurt on the ropes. Nürnberg’s home form does not bode well however, with just two victories recorded all season at the Grundig Stadion. Stuttgart may have now gone three games unbeaten, but Stevens is in no doubt that there is still plenty of work to be done. “We’re very happy to have won three points,” said the veteran Dutchman, "but there was still a lot of uncertainty in the team after the results of recent matches. That’s understandable, but I hope the victory gives them some self-confidence.” One man in desperate need of a boost is forward , who appeared rusty on Matchday 26 after missing five games through suspension. The Bosnian international is nevertheless expected to lead the line once more in a game that - on paper at least - is one of Stuttgart’s more winnable encounters in an extremely tough season run-in. Before the campaign is out, the Swabians face some of the Bundesliga’s finest, with fixtures against FC Bayern München, Borussia Dortmund, FC Schalke 04, Borussia Mönchengladbac and VfL Wolfsburg still to come.